Create new widget areas, fill them with widgets, and place them on any post/page you want. To make things easier here’s a project based example of what you can do with the Sidebar Commander. You know how to add the slider to your homepage, but how do you get it on a different page? Give it a name, and click the blue +options text. Select “Main Content” widget area type, then click add new. 4. On the page edit screen, select Template: Widgetized Page (on the right sidebar). Publish or save your page. 5. 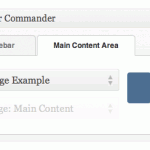 Scroll to the bottom of the page to the Sidebar Commander box, click the “Main Content Area” tab, and click your new widget area. Save or update your page. If you view this page live, you will see that your Nivo Slider is now there! If you want to make this a full width slider, go back to your page edit screen and choose “Full Width” under Column Layout on the right sidebar. You can add text and other things to your page by going back to Appearance => Widgets, and dragging another widget underneath your new slider.